37 members from the Association enjoyed a brilliant day out on Saturday 13th October, by travelling to the Cotswolds and firstly visiting Poppy Godwin's flock of prize winning sheep. Poppy and her mum Gill and father Tim firstly welcomed the members at their Fosseway Garden Centre Cafe' with complimentary teas, coffees and sheep biscuits! These were very welcomed! 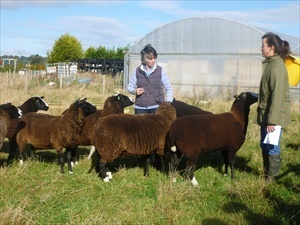 Poppy and Gill then showed us her flock of Z's, which have been acquired through various breeders. The morning was finished off by a quick visit into their lovely Garden Centre for a bit of shopping. We then travelled a short distance to Adam Henson's Cotswold Farm Park where we had a lovely lunch. We then had time to take in a farm walk and wander through the farm park. 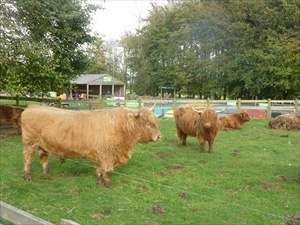 The Park is part of the 650 hectare Bemborough Farm, high on the Cotswold Hills. We had chance to see Eric, a Highland Bull, that often appears on Countryfile with Adam and also some Whiteparks, Belted Galloways, Soay Sheep, North Ronaldsay's, Portland Sheep and many more rare breeds. I think everyone thought it was a very worthwhile informative day and a good time to get to know other members and to meet old acqaintances.